Artist Profile: Paco Martín Spanish-born artist Paco Martín spends his days as a math teacher and his nights capturing the beauty of everyday objects with colored pencil. Step by Step: Sometimes what you have in your head doesn't end up working out once you put pencil to paper. Learn how Carrie Alderfer handles exactly that and still creates a stunning leopard on a clouded background. Grab Bag: Build a following on social media with these key tips and tricks. What’s new, Harry: Art Gear Guide’s Ivor (Harry) Harrison makes his COLOR debut with his opinion of colored pencil tools and supplies. 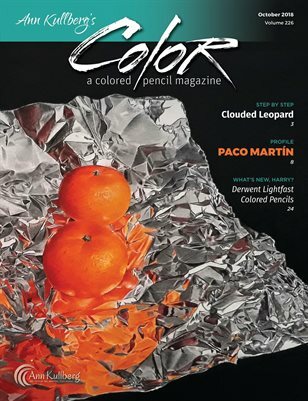 This month: Derwent Lightfast Colored Pencils.